Outreach materials are now available from the July 18 and 19 Deepwater Horizon Natural Resource Trustees' public events in Gulfport and Long Beach, Mississippi. 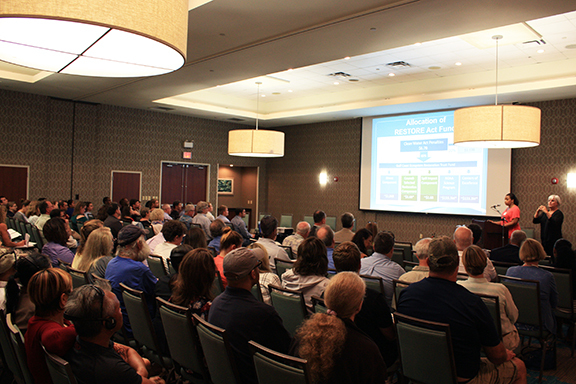 The events were held to help educate and update the public on restoration in the Gulf of Mexico. The first, a community outreach workshop on July 18 in Gulfport, helped community members and stakeholders learn more about restoration funding and processes, and how to get involved in proposing restoration projects. The second was the Trustees’ third annual public meeting held in Long Beach at the University of Southern Mississippi on July 19. At the annual public meeting, we provided an update on our work over the last year, and since the historic settlement with BP. You can view all the materials presented at the meetings - including the presentations and fact sheets - below. The Trustees' community outreach workshop in Gulfport, focused on the basics of the Deepwater Horizon Natural Resource Damage Assessment process and how it compares to other Gulf restoration efforts; as well as how to effectively propose restoration project ideas. The workshop also provided an opportunity for dialogue between community members and some of the Trustees’ staff, as well as staff from the RESTORE Council. Representatives of the seven Trustee Implementation Groups, responsible for planning and implementing restoration projects for the natural resources injured by the Deepwater Horizon oil spill, gave updates on their progress over the last year. The public meeting also included an opportunity for the public to provide comments to the Trustees after the presentation. This meeting served as the annual public meeting for the Trustee Council and the Region-wide Trustee Implementation Group. A transcript of the meeting containing both the verbal presentations and public comments will be available here shortly. Stay tuned to our website for more updates and news.